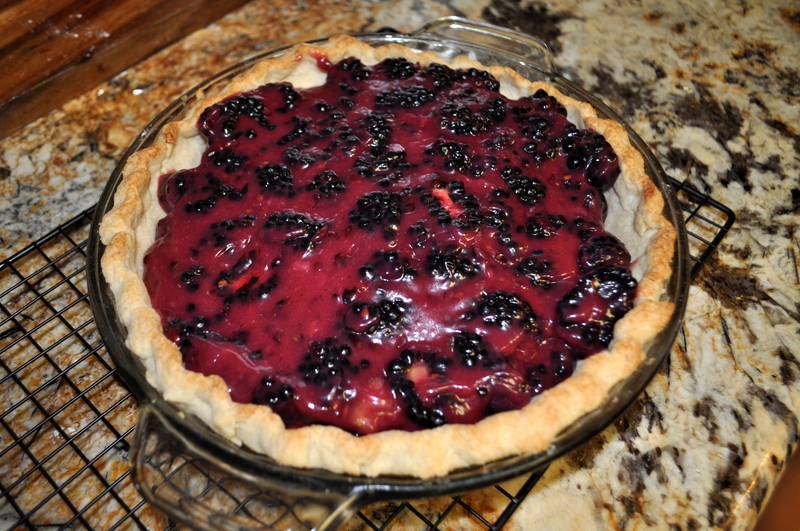 Here is another pie recipe…maybe I should just give in and rename my blog “Pie Recipes from Molly”. Then I could make fruit pies, cream pies, meat pies, quiches, the list goes on. Pie offers so many possibilities! But I do love all the other kinds of food that would be missed with a narrower focus…so this will continue to showcase all kinds of food with a heavy amount of pies. This particular pie is a riff on a pie my mom would make when I was growing up. My favorite thing about summer was my mom’s Fresh Blueberry Pie. A simple sweet gel with fresh fruit in a buttery crust. When the blueberries were first ripe, we would go out and pick enough for the winter to freeze. We would always make sure that we had enough left over to make at least one pie. Eating this pie was the highlight of my summer! For this version, I found some blackberries at Costco (I know, here in Hawaii we practically live in those places) that were just too juicy to pass up. They were so big in fact that I had to cut them in half before mixing them into the filling! Fresh whipped cream on the top and I was in business. So tasty and reminiscent of hot summer evenings as a kid. It was gone faster than I could blink. Looks yummy! I am starving now. This pie is a classic! Really the best way to enjoy berries!